This past December, the Leo District 4-C4 ran their Second Annual Virtual Giving Tree for the veterans. The Leos provided gifts to 52 veterans, all part of the Homeless Veterans Rehabilitation Program at the Veterans Affairs Center in Menlo Park. They also shared homemade cookies. The Leo District 4-C4 is comprised of the 17 Leo Clubs in the San Francisco Bay Area. The lead participators in the 2018 Virtual Giving Tree for the Veterans were the Menlo-Atherton Leo Club, San Francisco Unified Leo Club, and Capuchino Leo Club. Photo shows the Leos of District 4-C4 delivering the gifts at the Menlo Park Veterans Affairs Center. 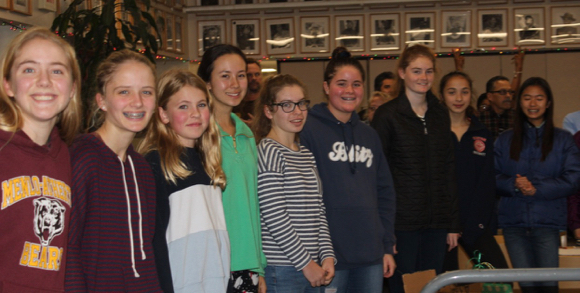 Pictured from left to right are Leos and guests: Elise Kratzer, Amelia Kratzer, Annika Jones, Charlie Smith, Sophie McCreary, Amelia Peyton, Elizabeth Young, Anna Patrick, and Amelia Wu. Here’s to a great 2019 with a sentiment by Menlo Park resident Tim Goode posted on Facebook — “health, happiness and a dose of luck to all” — accompanied by a photo by another resident, and longtime InMenlo contributing photographer, Frances Freyberg.